Pumpkin pie is perhaps the best pie you’ve never actually made. With Christmas rapidly approaching, Landmark Inn State Historic Site in Castroville has the solution for you. Through May 2017, Landmark Inn’s open-hearth historic cooking classes will explore how common dishes were prepared over an open-hearth fire 150 years ago. Students will go behind the recipe to discover the history and science of why certain foods taste the way they do while conquering different historic pumpkin pie recipes. Landmark Inn was founded by Swiss merchant Caesar Monod as a roadside tavern stand in 1849. Beginning in the 1850s, merchant John Vance expanded the site to include a large store, wash house, gristmill, and two-story hotel. The Monod Kitchen, built around 1850, functioned as the commercial kitchen for hotel and served patrons well into the 1880s. 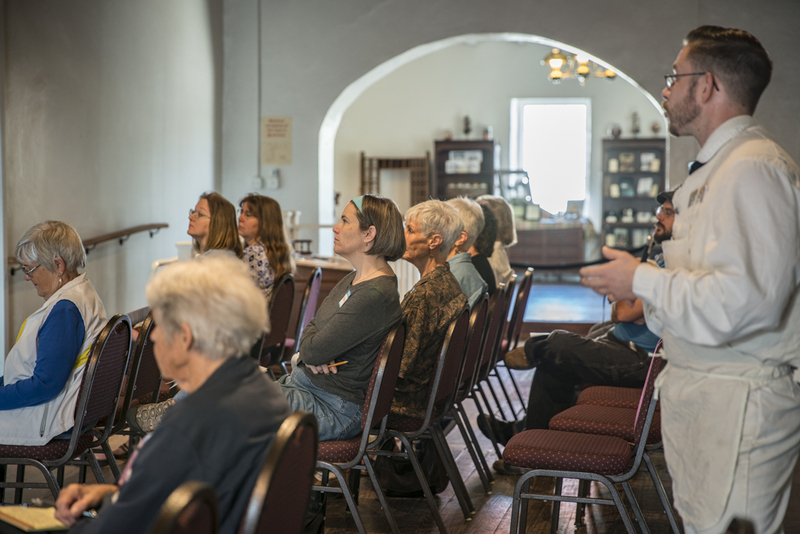 In 2014, the site underwent a two-year renovation project that restored the kitchen back to the way it might have appeared and operated during the 1850s. Food is a common language that connects visitors with the past, especially around Christmas. 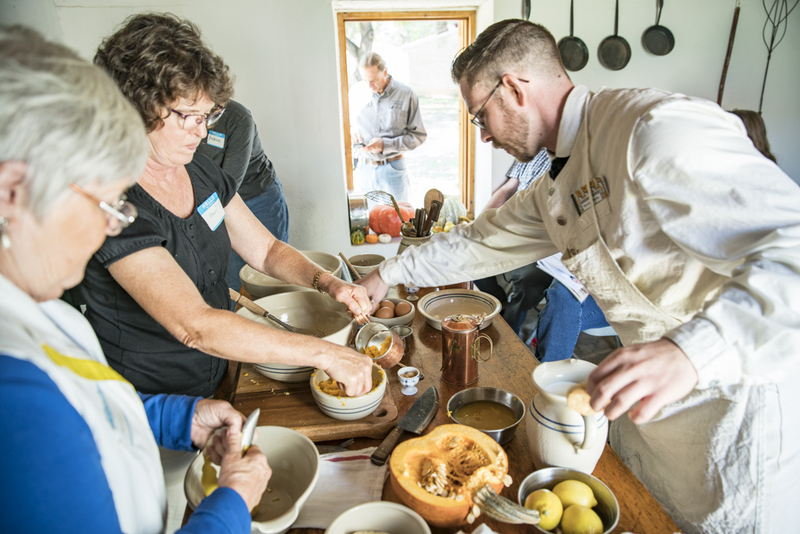 Since reopening in 2015, Landmark Inn in Castroville has presented immersive open-hearth historic cooking classes that enable visitors to rediscover the history of a dish using 19th-century technology in a 19th-century environment. While they were once cryptic notations found in dusty old cookbooks, historic “receipts” are adapted into reproducible recipes for the modern home kitchen. One of the primary goals of the Landmark Inn open-hearth cooking class is to make the flavors of the past more accessible and comforting to modern home cooks. Many cookbooks published during the 19th-century are available online for free, but most historic recipes call for ingredients or measures that are difficult to obtain or simply unavailable. For example, the ingredients in the recipes taught in the Landmark Inn open-hearth pumpkin pie vary from recipe to recipe. Historically, these variations often depended upon growing season or geographic location—neither of which informs the modern recipes of today. Pumpkin pie is technically pumpkin flavored custard. The basic ratio for custard is that one egg is needed for every eight ounces of milk. Most modern pumpkin pie recipes call for an equal ratio of milk to pumpkin, generally 12 ounces of each, along with two eggs to balance out the custard. In historic recipes, cooks would have used the equivalent of about one cup of sugar per pastry dish. All other ingredients simply enhance the taste or texture of the filling to make that iconic holiday spiced-pumpkin flavor. The recipe chosen for the open-hearth pumpkin pie class was originally featured in The Young Housekeeper’s Friend, published by a “Mrs. Cornelius” of Boston in 1859. Titled “Squash, or Pumpkin Pie,” this recipe has a bit of everything, including a butter substitution for milk, crackers for added thickening, and lemon zest to brighten the flavor. In a large bowl, beat together the eggs, butter, sugar, and lemon zest until creamy. Using a mortar and pestle or in separate bowl, crush crackers and combine with egg mixture. Add in the pumpkin puree, salt, ginger, nutmeg, and cinnamon; mix well. Gradually add in milk and mix well. Transfer the filling to a pastry-lined pan. Cover exposed pastry edges with foil and bake at 425° for 15 minutes. Reduce heat to 350° for 40 minutes or until the filling is nearly set. The top of the pie should be firm but jiggle slightly. Cool completely on a wire rack for at least two hours before serving. 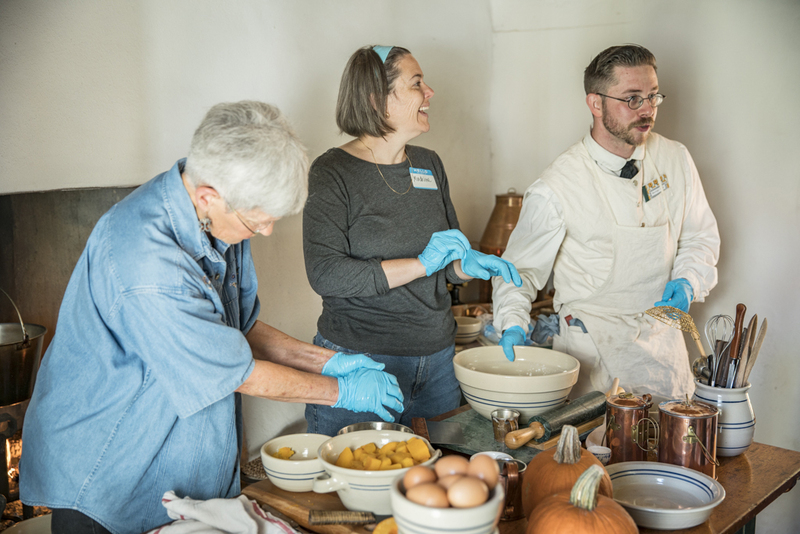 During the Landmark Inn pumpkin pie open-hearth cooking class, participants help process the pumpkin and boil it over an open-hearth fire. Students can also roll out scratch-made pastry dough using period equipment. After the crust is filled and the pie is on the fire to bake, it’s time for a classic pumpkin pie tasting. 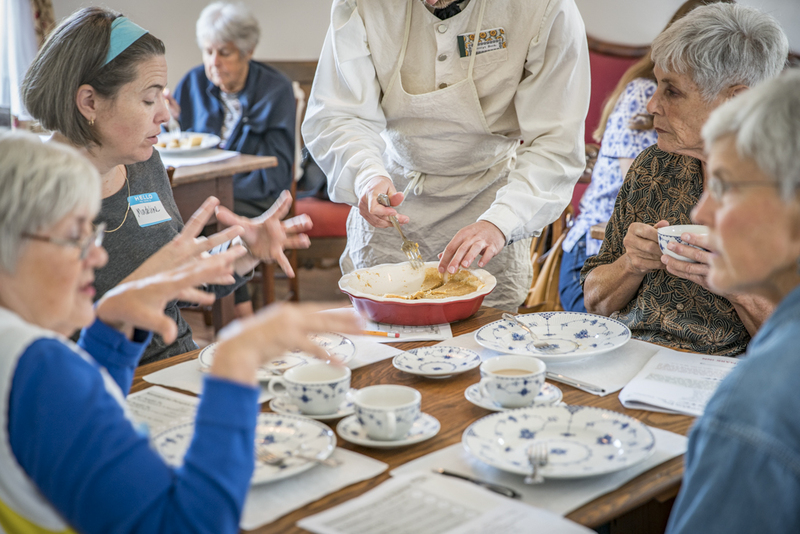 The students then depart with full bellies and the recipes to revive the taste of the past in their own kitchens this holiday season. 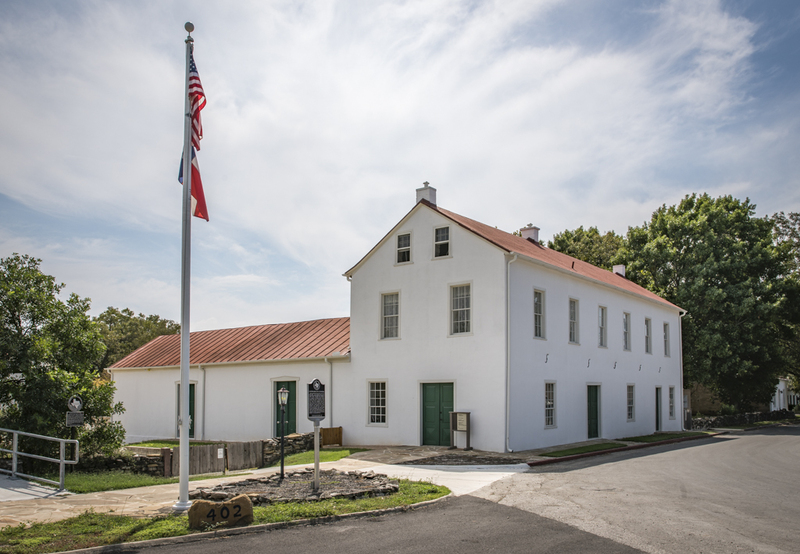 Learn more about Landmark Inn State Historic Site. 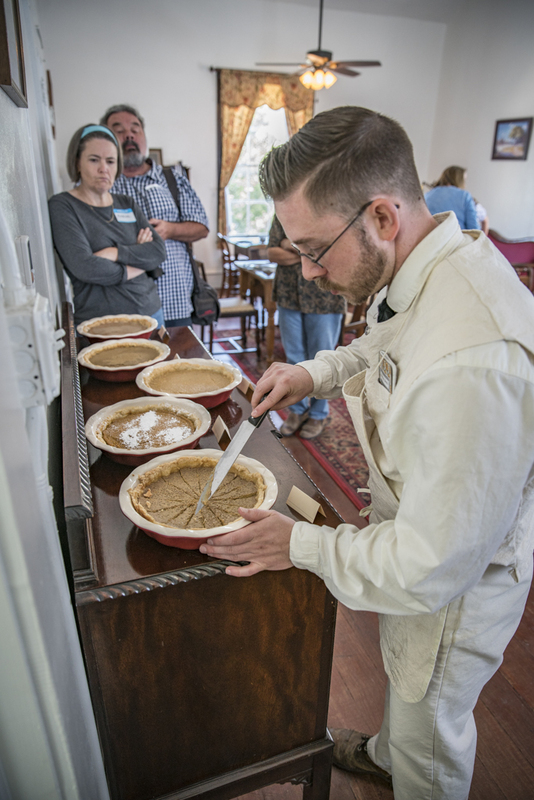 Join the Landmark Inn State Historic Site in Castroville to make vintage pumpkin pies for the holidays.